Lactic Acid that is! What were you thinking? I had my first organized trail run this weekend and it was the epitome of everything an organized trail run should be. Everything I worried about didn't happen, and everything I didn't think about happened. Let's first start off with the fact that there was a draconian downpour of rain, all through the night. Clearly God thought we were all going to be thirsty during this race. I had a great position at the start, right in the upper quartile of runners. After the gun went off, I was quickly passed by a good third of the field as they all sprinted up a hill. Then came my favorite part, we all stopped for several minutes, as this was a single-track trail run, so everybody had to wait in-line. Everybody who just passed me was now out of breath, gasping for air, and I wasn't even warmed up, much less out of air. I got in with a good group. Some older gents, who I could tell had a solid pace and this wasn't their first trail run. Surprisingly enough we all finished within a couple of minutes of each other, which is extremely surprising. Slow and steady may not win the race, but it helps finish it in a fairly respectable time. The first 3 miles flew by. Under normal conditions, you have views of the river on your left, but under these conditions, you were doing good to see 20 ft in-front of yourself. Seeing the 6-milers split off, I secretly wanted to join them, knowing they had a long, steep hill and then a speedy downhill to the finish. But like a moth to a flame, I was attracted to the coming pain. The next couple of miles had practiced several times, so it wasn't bad at all. Then came the next check point which read "5.5 miles completed 4.5 miles to go" Of course, if you aren't a runner this doesn't sound like a big deal, but trust me, after running up and down "hills" and through at least 20 creeks, I thought the checkpoint was supposed to mark the 5 or 6 mile mark -arrggghhhh. Then came this torturous hill, that I even saw some elite runners walking. This is when I started to feel my left foot pulsate like it had developed it's own heart. 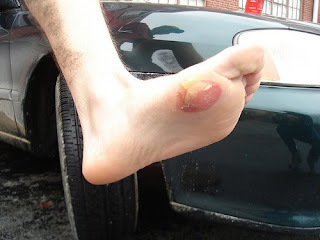 I knew at this point the blister I developed around mile 3 was now quickly filling up with vampire juice, or blood, whatever you choose to call it. After this arduous hill, it was an easy couple of miles. But then came the crucible. The "rock garden" This was the make or break point of the race - no pun intended. I failed miserably or I passed with flying colors, depending on your views of life in general. What the heck does this mean? Well, the rock garden is "impossible" to run through. At-best you will hop through it. But it is only to be hoped through by the first handful of elite runners in the race. Anyways, I was passed by A LOT of people - so I failed in this sense (one small detail worth noting, EVERY single person that passed me fell - or seriously slipped). I passed with flying colors in the sense that I didn't break my ankle and I had an awesome time, finishing it up with my friends. On a final note, I was originally going to ride my bike up there, but considering the thunderstorm, I backed down thinking it wouldn't be that good of an idea, and rode up there with my buddy Jon who is the founder and CEO of iMultisport, which provides insurance to people the insurance companies don't like (e.g. you sky-dive, you swim with Barracuda in the Caribbean, one of your life's biggest dreams is to run with the bulls, even though you used to ride bulls - ok enough about me). Anyway's I think it's a grand idea and Jon's a nice guy if you have any insurance questions. On Thursday (yea I know I'm behind) I had a great ride up Lookout Mountain. I took the "European route" which is up Ochs Highway, then took the extension over to Rock City and down the mountain. The reason it is called the European route, is during the extension ride you pass several waterfalls on top of the mountain that gives it a little European flare. It's my favorite loop after work. After this I sprint up a couple of "hill" in North Chattanooga and I'm home free to start running with my dog. I was a bit disappointed at how the video below turned out, as it didn't even come close to capturing the views up there, but hopefully you get the idea. And I think it's ok considering it's my first video. Last night was an adventure in it-self. For details, you can check out my wife's blog. We met a great couple and hit it off big time. The guy's main forte was mountain biking but he liked everything from climbing, to hiking, cycling, you get the idea. Oh yea, not an unimportant point - he's climbed Mt. Rainer, didn't summit, but he was there and climbed it! It struck me as in conventional sports, most guy's only like one sport such as baseball, but dislike another one (or all the rest) like football. 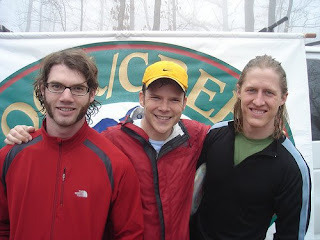 But all of the triathletes I have met and other endurance athletes I have met seem to just love the outdoors. This love transpires into many different activities and forms a common bond between friends. Ben Saunders from Ben Saunders on Vimeo. First, let me state the obvious: Swimming is really inconvenient. Running is easy to pick up, cycling is just too fun not to do and worth the hassle and gear, but swimming is just really inconvenient. I was going to get up early and be at the pool by 6:30 A.M. , strangely enough my wife woke up and told me it was really cold outside and just swim in the afternoon. As you all know, at 5:45 A.M. I was looking for any excuse possible, and that one seemed perfect. At 7:00 when I stepped outside, I saw and felt exactly what she meant. There was frost outside! It would have been a very cold morning. So I swam in the afternoon and met a guy who was training for the Sand Diego Half Ironman. I told him that I swam out there under forced conditions once (Marine Corps Boot Camp) and the water was pretty cold. He said he was more worried about the 9 ft. swells! I guess I won't have to worry about that in the river. Anyway, I swam for 30 minutes straight and felt good about it. I then did a sprint home in the hardest gears I could find. Today, I plan on enjoying the mountain on the bike and then running with my dog. The below story is from Dan Miller, author of the book 48 days (see sidebar). I thought the story was too good not to pass along. It was particularly interesting to me since everyone thinks I have it so hard running 6 miles into work (when I run). Lornah Kiplagat learned to run because she did not want to be late for school. Each morning, this little Kenyan girl would help her father milk the family cows as soon as there was enough light from the rising sun. Then she would run the 14 miles from her home to school – where she was an eager student, knowing education was her best option for a better future. At the time she did not realize that her running was laying the foundation for her world-class status as a long-distance runner. She ran because she was poor – but in the process she developed the discipline and stamina to rise above all competition in running. Could it be that there is an opportunity in something you consider a hardship right now? Most inventions, great books, and leadership skills emerge from those tough times in our lives when we needed a solution or the fortitude to just survive. As I look back on my own early farming days – yes, those days of just looking forward to leaving the farm – I now realize the value of having significant carpentry, plumbing, electrical and mechanical skills. Those insights have saved me thousands of dollars over the years and also opened my eyes to innovative solutions in business. My writing draws from the challenges I’ve faced myself in career and business. Is the “running” in your own life just a means to an end or is it teaching you and preparing you for something great? Maybe that long commute is giving you time to learn a new language or better parenting skills. Maybe the broken machinery at work is providing you the opportunity for the next great invention. Perhaps your constant struggle with fatigue is positioning you to discover a nutritional breakthrough. Lornah, that little Kenyan girl is now 33 years old. She holds four world records. She has also established an academic foundation for other little girls in Kenya. They are trained in athletics but also in academics and personal development. Lornah is committed to putting an end to the enduring tradition of female subservience in Kenya and recognizes that her running has given her the opportunity to be that force for change. I had a great run on Saturday. I think I ran about half of the trail and then another couple of miles. It was definitely dreadful climbing some of the hills, as my heart was screaming, but considering I was running with some very experienced trail runners, and I hung in-there, (and I biked to the meet-up point, and back) I was proud of myself. One of the best things about working out is freeing your mind from the clutter. BUT, sometimes it is nice to be available for emergencies. I predict in the next couple of years technology will continue to have a major effect on endurance sports. I found this from Springwise which is a weblog of innovative products. Back in 2006 we wrote about the Nike+iPod Sport Kit as an example of the growing number of branded brands—smart partnerships between brands —and now adidas and Samsung have launched an offering along similar lines. miCoach, which was unveiled just last week, is an adidas-branded Samsung music cell phone equipped with stride sensor and heart rate monitor to provide on-the-go personal training. With one click, users can connect to the fitness features and begin a workout. On their first use, the system assesses their fitness level and places them in one of three categories. Users can then set their own goals, or let the system's personal coach—backed by more than 200 workout plans—guide them. Either way, miCoach provides instruction to encourage and motivate users along the way, such as advising runners to “speed up to power zone” or telling them that “15 minutes is completed.” Tapping the slider phone twice produces instant updates on the workout, and the 2-inch LCD shows a real-time visual display of time, heart rate, distance, speed and calories burned. Users can arrange workout music on the phone according to tempo or motivational value, while a 2-megapixel camera and 1GB memory capacity let them capture their workout milestones. The miCoach also features USB and Bluetooth connectivity for fast file transfers and seamless sync with the miCoach web portal. The miCoach phone will be available in Europe starting in mid-March, with delivery in the US next year. European pricing will start at about EUR 195, according to the Associated Press. For more on branded brands, check out our sister site trendwatching.com's briefing on the topic. In the meantime, keep your eyes open for more of them! First a little history is needed on how I got into triathlons. I was training for a marathon when a friend of mine invited me and my lovely wife down to Hilton Head for a long weekend. He said he was going to do a triathlon. I thought this would be good cross training for my marathon and an ever better reason to go to Hilton Head, South Carolina. So long story, short I had so much fun training for the triathlon I completely stopped training for my marathon (VERY BAD IDEA!). Once or twice a week my friend and I would do a sprint triathlon after work. It was a blast. He's a great swimmer, we are both strong on the bike, and we are both strong runners but I've got a bit more endurance for the long runs, so it works out well. Yesterday, for the first time in 2008, I did this. After work I swam in my old University pool. (for those of you out there that need some boredom in your life- you really need to check out swimming) I was feeling pretty good honestly. I did a quick warm-up and then went into some drills). At this point I'm thinking , "surely I haven't been in here for 30 minutes, but at least 15 minutes" Does anybody want to guess how long it had been? Yea, a whopping 5 minutes! So more drills and such and I eventually cranked out a little over 1/2 mile. Then onto the bike. Question: Why is it so hard to bike after the swim, even though I really don't use my legs when I swim? Please email me or leave a comment regarding this. I was planning on tackling my favorite mountain, but got caught in a dust-storm of 30 mph winds and figured that probably wouldn't be the best environment for going down a mountain at 50 mph on a 15 lb bike. So, I cut it a little short and went home and grabbed the dog for my favorite short-run. In my neighborhood there is a run that truly defies common sense it is only about 2 miles but it takes around 15 minutes and 90% of the time you are going up-hill. So I give myself a little break on the distance since the whole thing is uphill. My 85 lb weimeraner used to literally lay-down and refuse to do it. But now she loves it and I think it is her favorite route as well. Since I started this with a story about a great friendship I should probably end it with one as well. This morning around 6:30 I got to a local coffee shop for my usual Wednesday morning bible study. I get there a little early to go over my notes and for quite time. This morning I couldn't help but overhear another bible study that hadn't started yet. All the guy's were talking about how the NCAA tournament and how the brackets are wrong, the placing is wrong, the odds are wrong, etc... The whole time I was thinking "if I was over there I would have nothing to say" So when all of my friends showed up we immediately all started talking about the big trail race in two weeks, we were all giddy about it, talking non-stop about our favorite adventure race we have done, and this Saturday we are going to run it together for practice. In summary, I think the triathlon/endurance racing community is filled with great people and if you aren't involved in some way, you are really missing out on some great fun! This is the week I'm officially starting my swimming training. I had a great run into work today. The weather was so good I actually wore shorts! As for my Nike+iPod it continues to be a Love/Hate relationship. This morning it said I only ran 5.1 miles when other mornings it usually say's something like 5.9 miles. Hopefully, I can get to a track this week and calibrate it. I'm pretty stoked that I'm going to be using my old college pool and saving around $40/month. I hope it pans out. This weekend I took a break from my usual trail running as Saturday there was a downpour and on Sunday (knowing the trail would be soaked) I took the day off and spent the entire day at the park with my wife and daughter and some friends and family. It was great! I had a great ride yesterday. My wife called at 5:00 and wanted to meet friends downtown, so I needed to make this a quick ride. I went up Lookout Mountain and had some great riding, enjoying both the weather and the views. The real excitement came after though, when I saw a fellow rider in my sights. Now this rider was no normal cyclist - he was THAT GUY. You know who I'm talking about, because every city has at least one. He was sponsored (or a pro, depending on who you listen to) and he had his matching $250 cycling shorts and jersey on, with his $150 sunglasses and iPod and $200 helmet and $200 shoes. When I saw him, I immediately sped up and was on the chase. As I passed him I asked: "did you just do Lookout Mountain" he said: "Na, just staying flat today"
I want to be clear I didn't pass him to feed my ego, as I know there are and will always be a massive amount of people faster than me. But I passed him for YOU. If you are like me and have some cycling shorts that have holes in them and a jersey that kind-of stinks but you wear it anyway since they are so freaking expensive and got your shoes on clearance because the cleats are missing some screws, and wear a mountain biking helmet while you ride your road bike because, you don't want to buy two helmets, and well o.k., you get my drift. Normally , the stuff doesn't bother me, but I make it a point to wave or something to everyone I pass. Unfortunately, there is a fair amount of arrogance in the cycling community - for reasons I am much too poor to understand. Nevertheless, I can guarantee I have more fun than anyone I know. I raced home passing a couple of more cyclist and then went out and enjoyed a smoothie with my wife and friends. 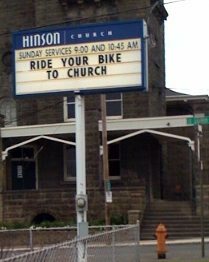 Here in Portland, Hinson Baptist Church (not affiliated with any other Baptist group) is doing their part to encourage bike use. Church on SE Salmon and 20th. Hinson has partnered up with the Bicycle Transportation Alliance (BTA) and the Community Cycling Center (CCC) for a series of events this spring. The BTA will hold a bike safety workshop at the church in May and the CCC will show up in April to help with a free bike tune-up day. When they held the free bike tune-up day last year, Evernden says over 100 people showed up. He adds that the events are open to anyone in the community, not just church-goers. Evernden also says he’d like to partner with the BTA to hold a friendly competition with other churches to see who has the highest number of bike commuters in the congregation. Maybe the BTA’s Bike Commute Challenge should add a “Church” category to their contest next year! 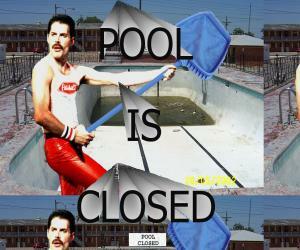 Well, I was definitely planning on starting my official swim training this week but the pool is closed for spring break. So instead I have been "roughing it" in this gorgeous spring weather of mid-60 degrees. It's the perfect temp I think for running and cycling. I'm climbing a mountain after work and probably will do some trail running this weekend. The picture below is what the trails look like that I have been running on the past couple of weekends. So it's pretty easy to see why I prefer this over asphalt! 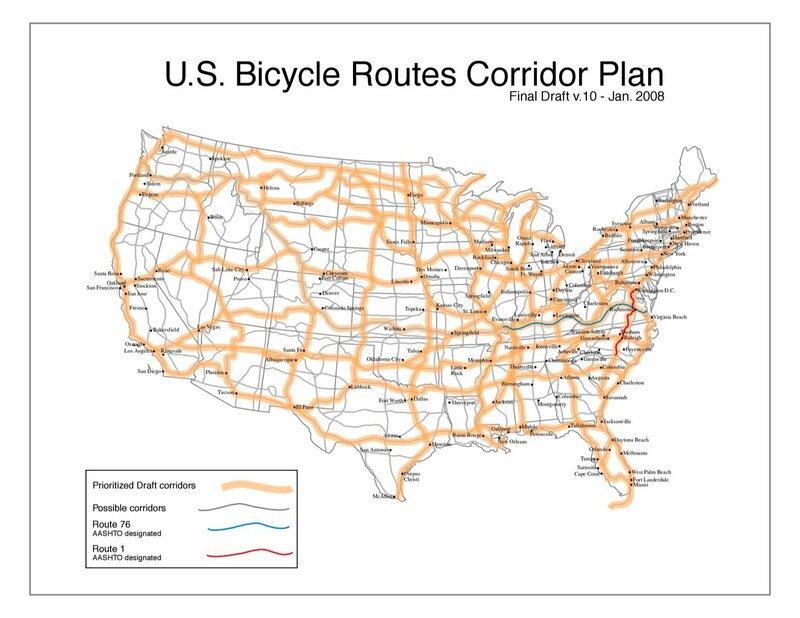 This week is the National Bike Summit. 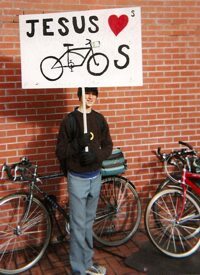 Please read the following and hopefully something will motivate each and everyone of you to bike more! Well this morning I was officially named a "hard-core enthusiast" as we had a turantial downpour of rain and yes I was out there riding my bike to work. This is the third time this week I have rode in some pretty hard rain. People always look at me like I'm some sort of freak, but I believe in relativity. Sure in relation to their nice warm and dry car, it sounds pretty crazy that I ride in the rain, snow, hail and freezing temperatures. But considering for the past 2 years and 6 months I have had ZERO expenses related to an automobile - who is crazy now? Also, I'm not really as tough as people make it out to seem. I simply have forced myself into this scenario where I will either succeed in a major way or fail. I have managed to succeed. Another point on relativity is that I tend to read a lot of high adventure books. The last book I read was about Shakelton. When he wrote in his memoir: "the weather was nice as it warmed up to negative 50" How could I ever complain about the weather in Chattanooga relative to that? The video below is from the Knippels Bridge in Copenhagen during rush hour. Is it any wonder than Danes make up the happiest nation? Note that a dedicated bus (and tulip truck) lane provides some separation between the cars and bikes. Imagine how many more lanes of roadway would need to be built if these cyclists were in their own individual cars. The best coverage of the National Bike Summit can be found here. Crazy Cyclist can be found here. This morning I did fartleks - speed play - for you non-Swedish folks. I am already feeling sore, so I know by Saturday I'll be really feeling the burn. First mile was a warm-up, then I sprinted for 2 miles, then I coasted downhill for a little bit, and then I sprinted the last mile, then I cooled down for a mile. The last mile really stunk. I thought I was going to put-up a good time, needless to say it wasn't. But I am excited about this weekend - I think the weather is going to be good and I am running with semi-pro friend Matt. He is a very accomplished trail runner, in my humble opinion, and I can't wait to get any secrets I can from him. I have a great feeling that this is going to be one of my most controversial posts yet. First and foremost, I want everyone's opinion so of the 100 or so folks who visit everyday - I want to see your thoughts on this issue in my comments section. So here it is. I was having this great run on Saturday, flying through the woods, I even came up on 2 whitetail deer. I was still enjoying the epic views and awesome waterfalls, but I was really running fast for me while still enjoying nature to the fullest. Then towards the end of my run, at the last mile, I ran past somebody. This somebody, wasn't just anybody, but the owner of a local outdoor apparel store, who basically has a monopoly on the local market where I reside. This is a another issue I will blog about another day. What bugged me, was that this guy was trail running with his iPod! Isn't the point of getting out there and being in the woods is to get a way from it all? I have never ran a marathon with an iPod because I have always felt I wanted to get the full experience and I just thought music would somewhat hinder that experience. All of the non-marathoners I know, kid me on this issue, saying this is why I run marathons so slow. But I run marathons for me not for the clock. Now for full disclosure, I do run into work with an iPod every now and then when I need something to take my mind of the mid-teens weather or the humidity or whatever else - but this is in the city! NOT the woods! So does it bother you when you see others out in the woods with their iPods or does it just add to the experience?